Today is the feast day of Saint Thomas de Aquino or Saint Thomas Aquinas. I have been waiting to write a post on Thomas for 364 days (TomPerna.org turns 1 year old tomorrow). As I have been thinking on what to write, it came to me that a reflection on Saint Thomas Aquinas was probably the best thing to do. A reflection is ideal since my fellow Catholic Bloggers will talk about his life and writings today. I consider him to be my favorite saint. 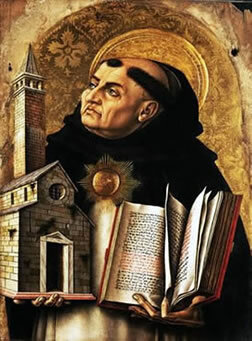 Now I was not named after Aquinas, but since reading G.K. Chesterton’s, Saint Thomas Aquinas – “The Dumb Ox”, his life and his writings have always intrigued me. My friend, Robert Kloska, (“BK” as many of his friends call him) first introduced me to Chesterton and his book about Aquinas. 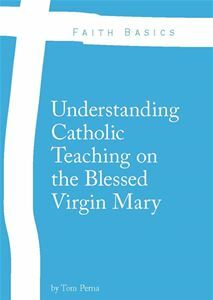 BK is also the same man that really got me hooked on Blessed John Paul II. It could be easily said that Bobby was the one who inspired me to learn about these two men, which in turn, inspired me to study Philosophy in my undergrad and return years later for a Masters in Theology. Thanks BK! When I was in the high school classroom, I spoke about Saint Thomas Aquinas in ways that the students could understand him. Using advanced theological terminology with high school students can often confuse them on such a great master of the theological pen. Explaining him in the simplest terms, without watering down his thoughts, was an enjoyable experience. However, there were three points that really use to stick with the students – first, his parents wanted him to be a Benedictine since that was THE order to join at the time. He chose to be a ragtag Dominican. A newer order at the time, they were a real motley crew of men. Most of the time they begged for their food and their overall way of life was difficult. It was not the great life the Benedictine Monastery offered, but I bet his parents would love the order today (especially with orders like the Sisters of Mary, Mother of the Eucharist in the Dominican fold). The Order of Preachers is known for their great charisma to preach and educate. Second, he was known as the “Dumb Ox” while a young student in school. It is said that he was a large boy who barely spoke any words. His fellow students nicknamed him the above label. Well, he might have looked like an Ox, but he became one of the greatest minds and theologians the Catholic Church has ever claimed. Although he remained a large man throughout his entire life, his mind was much larger than his physical presence. In his short 48-year old life (maybe 50 years), he gave us many great works that include the Summa Theologica, Summa Contra Gentiles, and many prayers and hymns that the Church still uses in her liturgies today. And finally, Saint Thomas Aquinas is the Babe Ruth of his time. Just like the Babe (yes, I am a New York Yankee fan), who revolutionized the game of baseball as it was played; so did Aquinas revolutionize theology. It can be said that Saint Albert the Great (Thomas’ teacher) baptized Aristotle a Christian and developed the Scholastic System using the reason of Aristotle to better explain the faith, while in turn, Thomas confirmed Aristotle and perfected the Scholastic System. These two great Dominicans (not bad for ragtags) completely changed the way theology was written, spoken, and studied. If you are interested in further studying the life, philosophy, and theology of Saint Thomas Aquinas, besides reading the Summa Theologica or the Summa Contra Gentiles (they are BIG), I suggest the texts below. There are many others but these are some from my personal library. St. Thomas Aquinas by M.C. D’Arcy, S.J., D.Litt., M.A. As we begin “Catholic Schools Week” here in the United States, let us ask Saint Thomas Aquinas (Patron of Students and Schools) to Pray For Us! Great post on the greatest philosopher of all time.